On the Accounting Sync tab of your settings, scroll to the bottom and you can choose to sync your corporate card transactions to a single card feed, or multiple card feeds in your accounting software. This option is best if you manage your corporate card transactions in a single feed in your accounting software. Click the second option and then select the register that you want your corporate card transactions synced to. Click Save, and you're done! Any approved corporate card expenses will sync to the card feed you've specified. If you have separate feeds for each card in your accounting software, or employ multiple card programs with different banks, you may need to map each card individually to it's own register in your accounting software. To do this, select the third option to sync to multiple card feeds. Then, for each card, choose the corresponding card feed. This is the feed where approved corporate card expenses will sync to for that card. 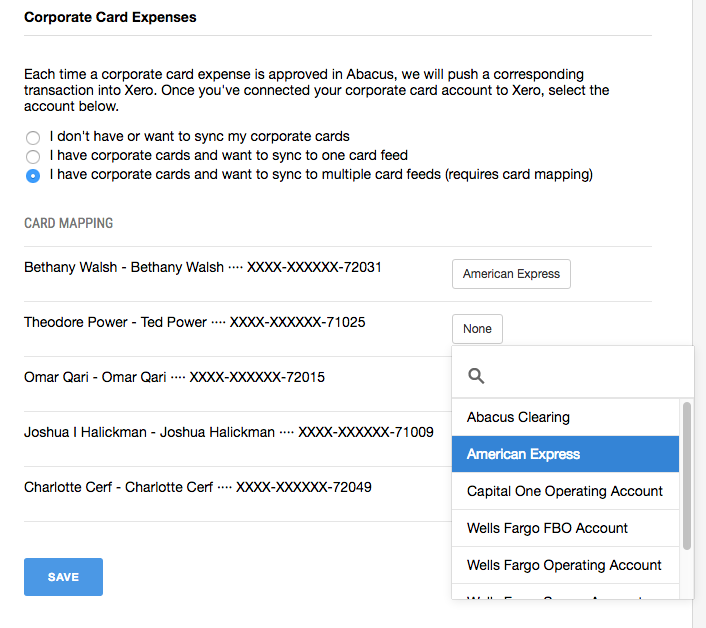 Click Save and you're done; any approved corporate card expenses will sync to the card feed you've specified. When do my corporate card transactions sync to my accounting software? When transactions are approved by an admin, they will be synced into your accounting software automatically. If you're also syncing in your card transactions from your bank statement, those transactions will match up.